Prague Castle overlooks the city and the Vltava River from its hilltop location, dominating the skyline of the western half of Prague. 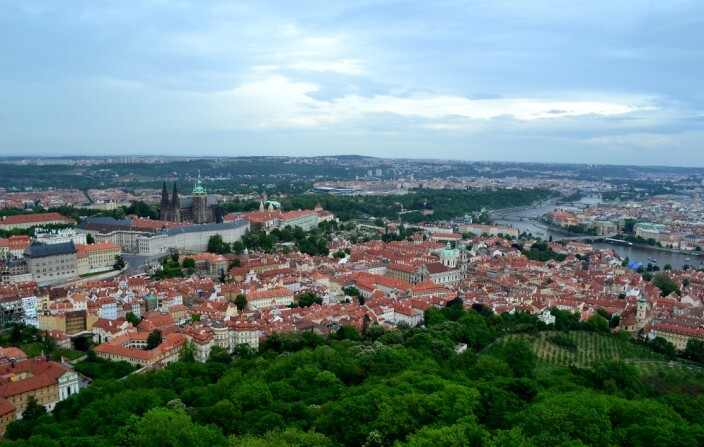 The castle is immense and views of it are inescapable from just about any vantage point in Prague. No less an authority than the Guiness Book of World Records lists Prague Castle as the largest ancient castle in the world. It spans 570 meters in length (that’s more than six football fields for the Americans reading this) and averages around 130 meters wide, encompassing an area of nearly 70,000 square meters. This translates to approximately 700,000 square feet! Yes, it’s a big place, more than you could ever take in completely in one day. 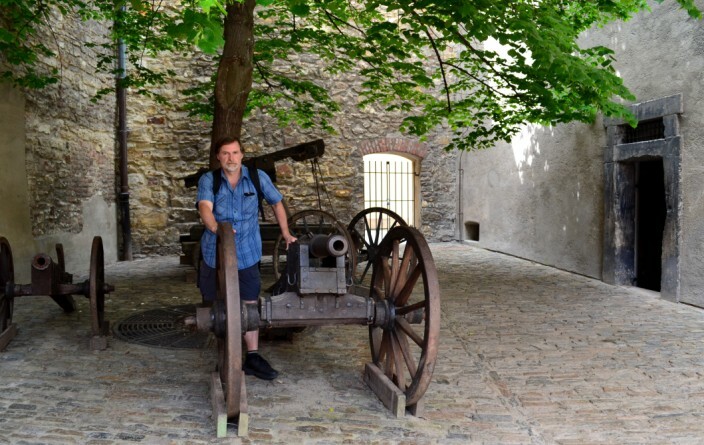 Of course, large parts of the castle are closed to the public, as this is still a working environment and seat of the current Czech government, as well as one of the main tourist attractions of the city. 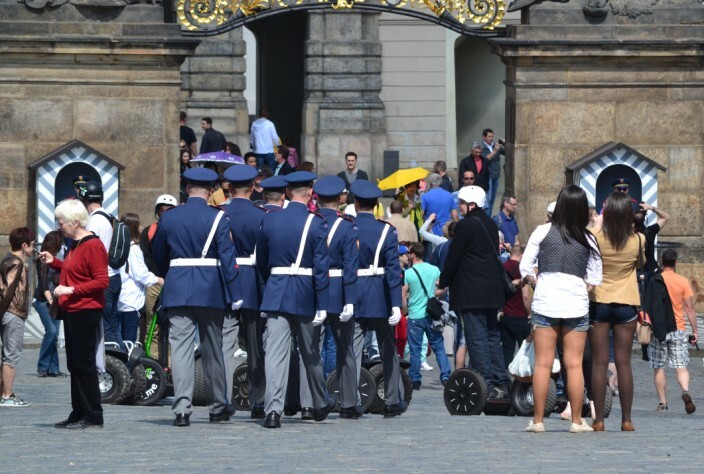 From what we could tell on our visit, the Czechs do a good job of balancing these two disparate elements, funneling visitors in and around the grounds while still maintaining the everyday functioning of their government. 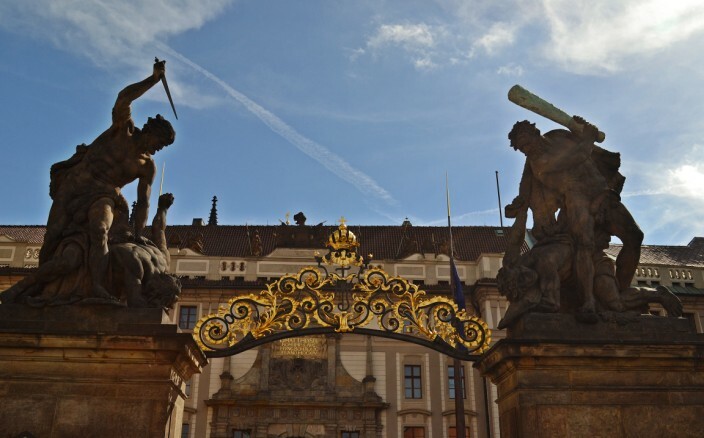 The history of Prague Castle, like so many of the great European castles, is replete with stories of kings, battles, emperors, wars and intrigue throughout the many centuries of its existence. 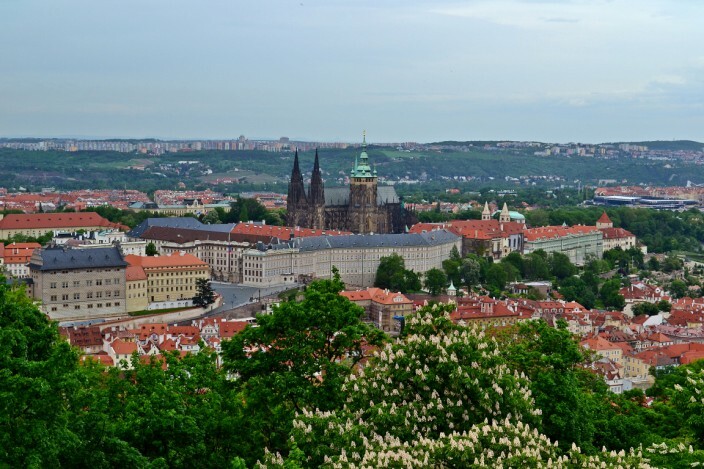 The first buildings on this site date from the 9th century, with the foundations of the Basilicas of St. George and St. Vitus beginning in the early 10th century under the reign of King Vratislav and his son, St. Wenceslaus. After those guys came a succession of Kings of Bohemia and Holy Roman Emperors right on through to the presidents of Czechoslovakia and the current day Czech Republic. 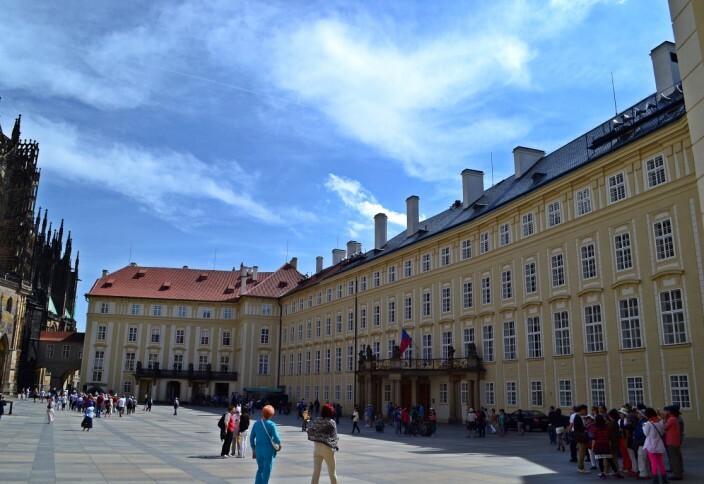 Some of the more notable inhabitants were Charles IV, various Habsburgs, Empress Maria Therese, and Vaclav Havel, the first president of the Czech Republic following their split with Slovakia in the 1990’s. Even the Nazis set up headquarters in the castle during their occupation of the country in WWII. As you might expect with a complex this huge, Prague Castle is a real hodgepodge of architectural styles, with elements of just about every type of architecture from the last millenium visible somewhere. 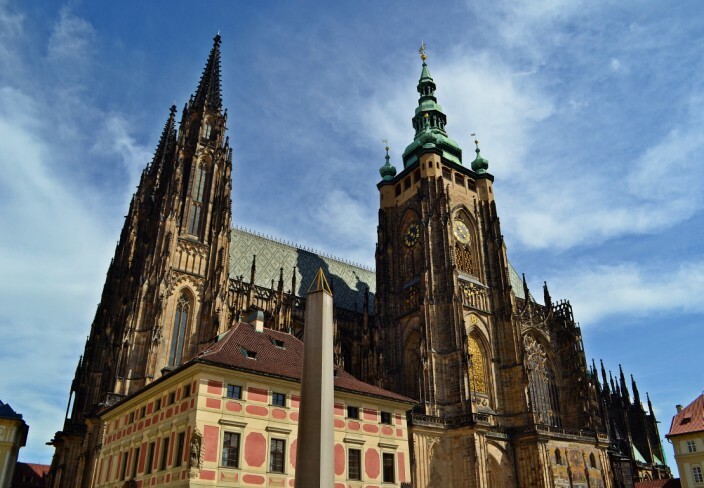 You have the High Gothic of St. Vitus Cathedral, the Romanesque Basilica of St. George, convents, monasteries, palaces and ballrooms, art galleries and museums, gardens and defense towers and dungeons. 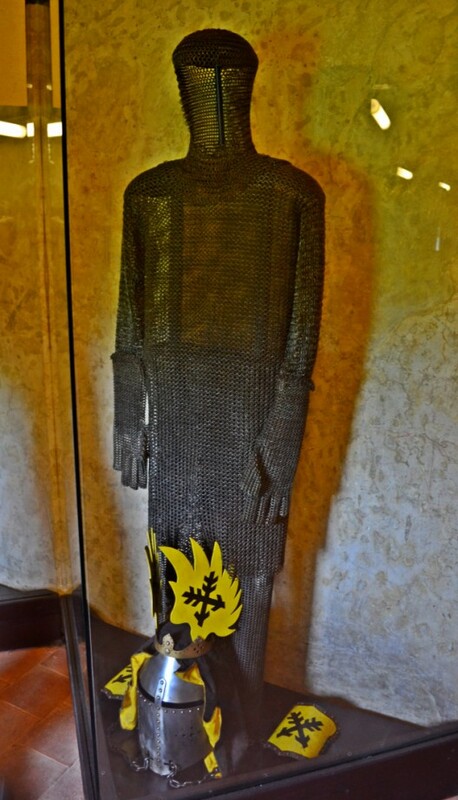 One of the most important exhibits is a room which houses the Bohemian Crown Jewels. However, chances of seeing the jewels are slim to none, as they are only shown to the public on rare and very special occasions. 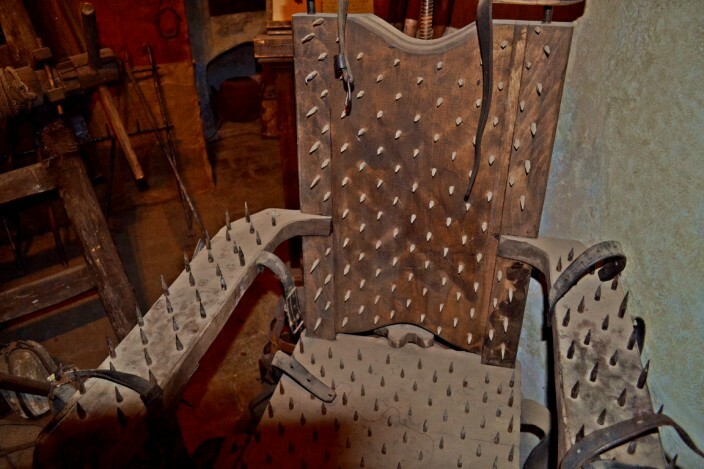 So, to sum up, just about anything you might associate with a castle can be found here in one form or another. 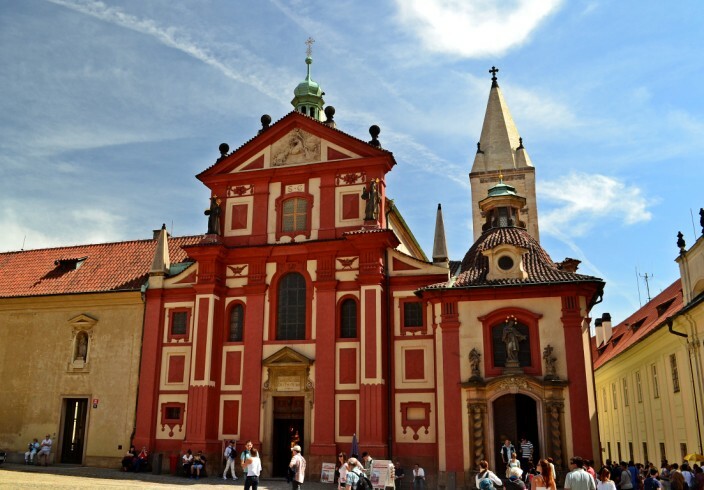 We made the trek to Prague Castle twice during our stay, once on foot, once by bus. From our base in the New Town district of Prague it was quite a lengthy trek to the castle, but nothing a person in reasonably good shape and decent footware couldn’t handle. 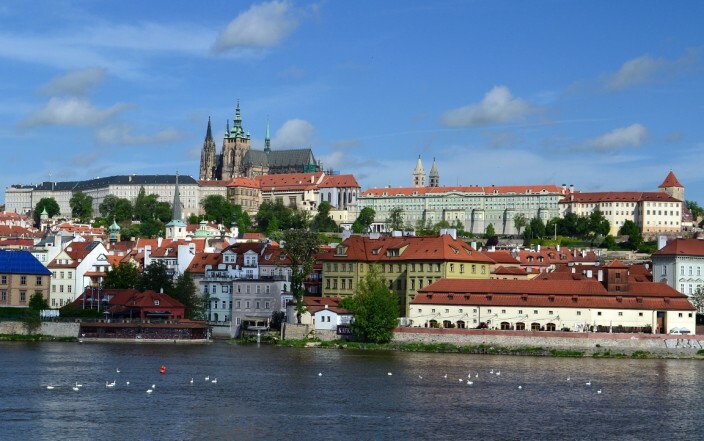 We actually prefer to see any new city this way, from the ground up so to speak, and in the case of Prague Castle you really can’t miss it. Just cross the river, keep looking up and head for the high ground. Probably the main attraction of the entire castle is St. Vitus Cathedral, a place so spectacular and overwhelming I’m going to devote a separate article to it later on. 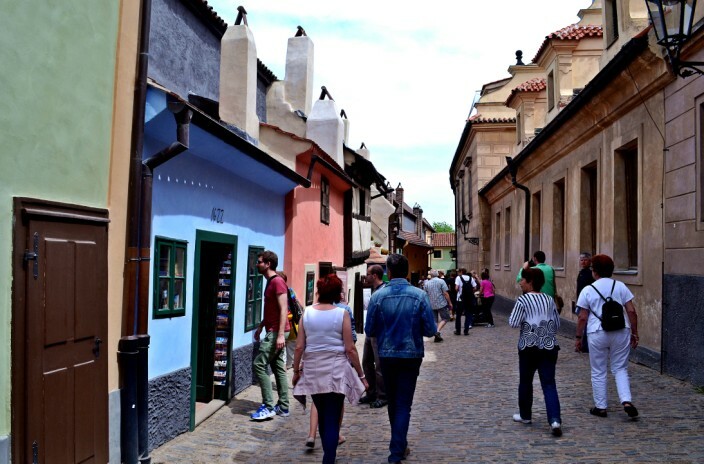 One of the most interesting places within the castle is an ancient street called the Golden Lane (Zlatб uliиka). Golden Lane dates from the 15th Century and has a beautiful, old-world quaintness about it. It is comprised of eleven tiny historic houses, inside which period scenes have been created to show the life of the artisans who once worked, ate, drank and slept in them. Did I mention they are small? Even a not very tall guy like me had to stoop to avoid bonking my head on the doorways and inside they aren’t anyone’s idea of spacious. One of the houses is known as the Franz Kafka house, where the famous Czech author lived for about two years as a penniless, struggling young writer. 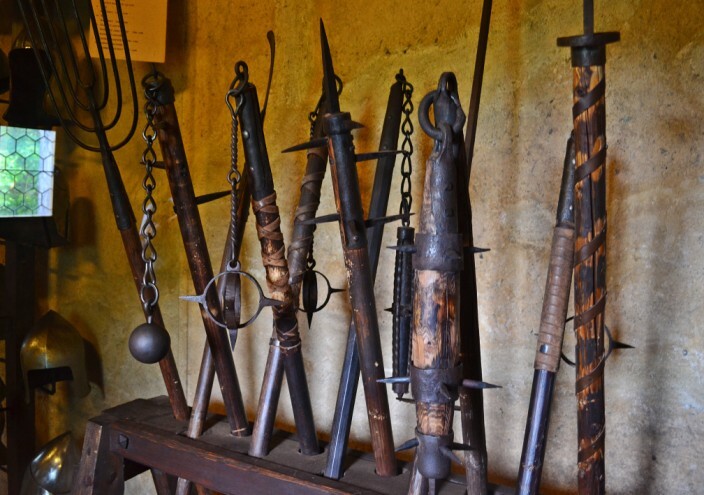 In the upper level of the houses are a medieval armory and textile displays, as well as a room depicting various medieval torture instruments. 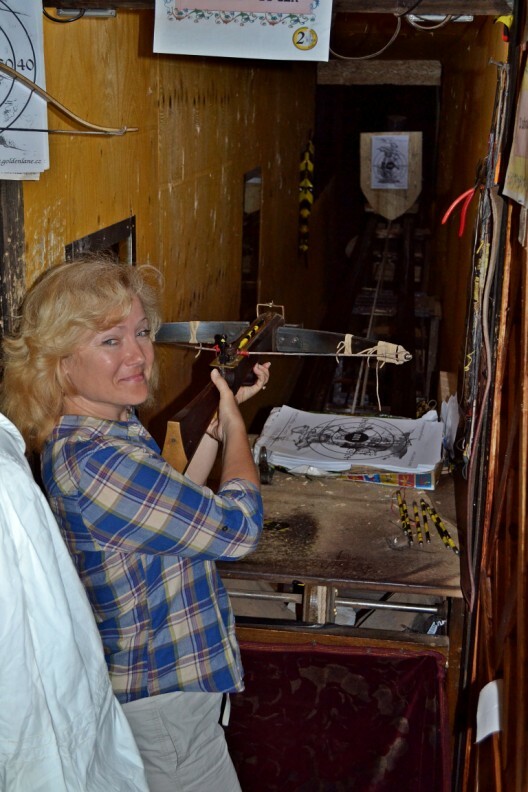 Visitors can also try shooting a crossbow, which we did with varying degrees of success. Okay, full disclosure: my wife did it better than I did, a difficult thing for a medieval junkie like me to admit, but there it is. I just needed a little more practice. After several hours wandering the grounds, we stepped outside the castle walls intending to visit the highly regarded gardens. Unfortunately, we should have done it sooner. When we got to the entrance, the gardens were closed for the day, as only so many visitors are allowed inside the garden during any one day and they had already reached their allotment. Bummer. And when we returned to the castle two days later as part of a city bus tour excursion, we only had about an hour to spend at the castle, not nearly enough time to do the gardens justice. 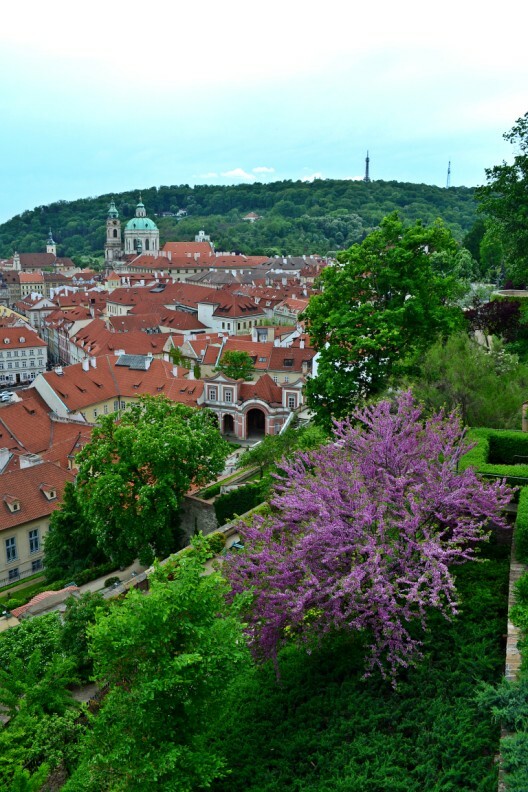 I guess the gardens will still be there next time we visit, and Prague is surely a city that will beckon you to return and experience its charms again. Hello Margaret, thanks for stopping by and commenting. 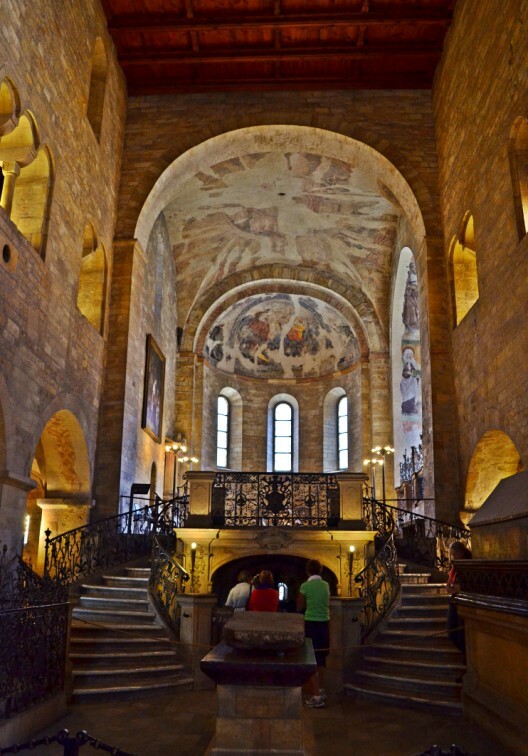 Yes Prague castle is truly impressive in every respect, inside and outside. 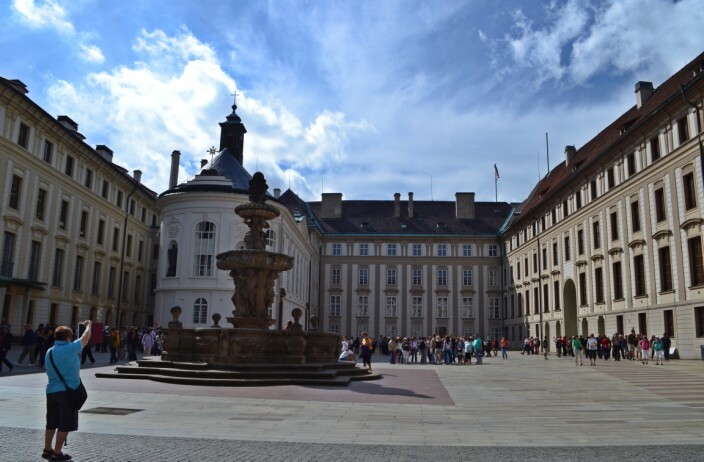 Prague castle is a must see! 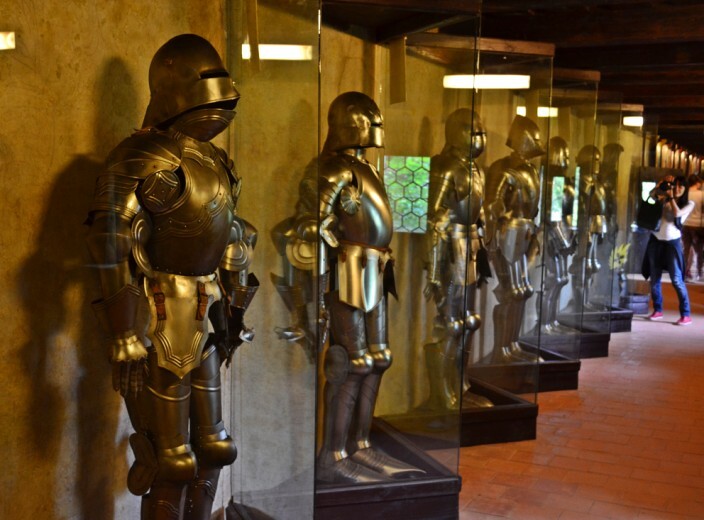 It gives you a different view of the place as well as brings you back to the medieval times. Hi Mieke, always appreciate your comments. 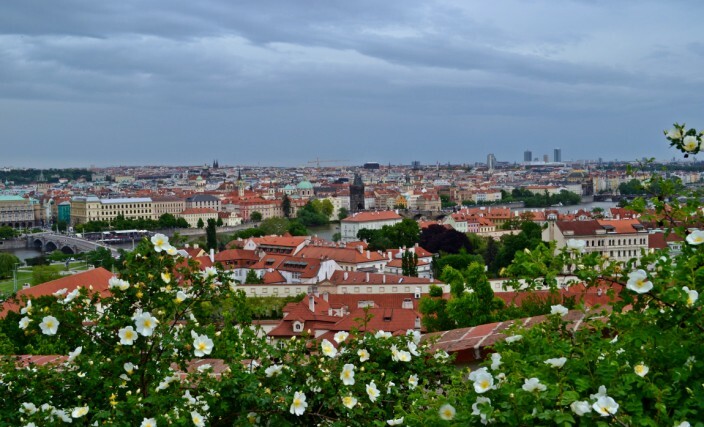 Great pictures, as always, and you capture the mood of Prague, especially in your panoramic pictures.